The Louisiana rental agreements are between the lessor and lessee of residential or commercial property. The document binds the parties into a landlord-tenant relationship that allows the tenant to stay on the property by payment and following the rules as outlined in the lease. It is understood that after the form is signed both parties are obligated to perform until the contract’s end term. All residential agreements should follow the Louisiana Attorney General’s Guide to Landlord and Tenant Laws. Rental Application – Form used to verify a tenant is who they claim to be. Association of Realtors Lease Agreement – Provided by the New Orleans Metropolitan Association of Realtors for the use of residential tenancies. Commercial Lease Agreement – Used for property that has an office, retail, industrial, or any other type of space that may be available for a business to operate. Lease with Option to Purchase (Lease to Own) Agreement – Standard rental contract that gives the lessee the power to buy the premises with an option listed in the document. Month to Month Lease Agreement (CC 2728) – Has a start date and no end period. The tenancy ends when either the landlord or tenant gives the other party ten (10) days’ notice before the next payment date. Room Rental (Roommate) Agreement – A written consensus among persons living in a shared housing arrangement. Standard Residential Lease Agreement – Landlord and tenant arrangement with a fixed start and end date. Sublease Agreement – Form for a tenant who wants to rent the space they are under contract for to someone else, known as the “subtenant”. 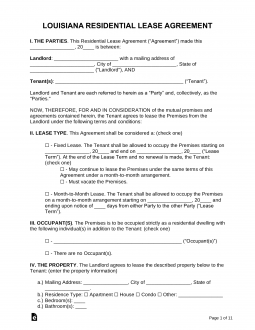 Termination Lease Letter (CC 2728) – Notice allows for ten (10) days for either the landlord or tenant to give the other notice of cancellation/vacate. The State of Louisiana does not have any required disclosures. Although, any structure that has been built prior to 1978 must be fitted with the Lead-Based Paint Disclosure Form. The landlord is not required to give the tenant notice before entering the property for any repair or any other reason. It is recommended that the lessor always be in good communication with the lessee and always give them some type of notice. Maximum – There is no State cap. The landlord may request as much as possible from the tenant. Returning (Revised Statute 9:3251) – The landlord has one (1) month from the tenancy end date to return the funds back to the tenant.